Selection of pressure instrument for a particular application must be done carefully, taking into consideration various aspects such as process conditions, turn down requirements, accuracy, installation requirements, and so on. While selecting a pressure instrument for a particular application, the process data such as fluid phase, pressure, temperature, density and viscosity must be correctly defined for all operating conditions including start-up, emergency operations and design conditions. Another important parameter for selection is the turn down requirements, based on which we can select the pressure instrument to suit the maximum and minimum conditions within its specified accuracy limits. In addition to the above, the installation requirements of the selected pressure instrument shall be carefully addressed taking in to account visibility, accessibility, because these requirements may affect the piping layouts. As shown in the figure below, the input pressure is given to the piston. This moves the piston accordingly and causes the spring to be compressed. The piston position will be directly proportional to the amount of input pressure exerted. A meter is placed outside the piston and spring arrangement, which indicates the amount of pressure exerted. As the device has the ability to withstand shock, sudden pressure changes, and vibrations, it is commonly used in hydraulic applications. Mostly, the output of the piston and spring arrangement is given to a secondary device to convert movement into an electrical signal. The bell gauge is a type of pressure transducer that measures differential pressure between 0.06 Pa and 4 KPa. The static pressure may be as high as 4 to 6 MPa. The schematic diagram of a single element bell gauge is shown below. The movement of the bell is taken out by link and lever mechanism or by some electrical methods. When the bell moves maximum up or down it closes the inlets of pressure p2 or p1, whereby protection to overrange and reversal of pressure are afforded. 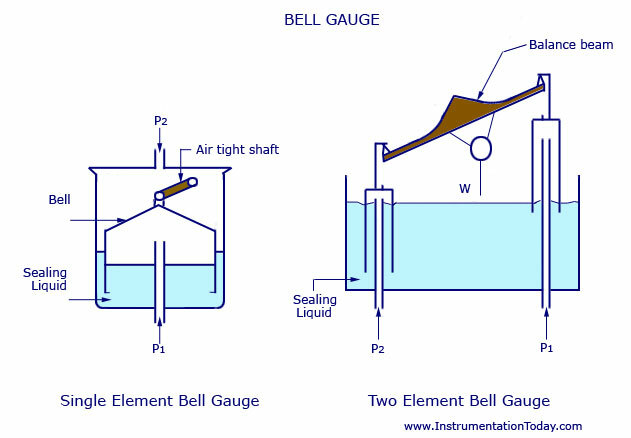 The diagram of a two element bell differential gauge or balance is also shown above. The two identical bells are suspended from the two knife edges of a balance beam. The differential weight is balanced statically by the movement of the counter weight w.
kindly can u send me complete explanation of u tube manometer in which construction and working of u tube manometer should also b mentioned……thanx for ur kind fovour…. We are a Chinese pressure sensor supplier .Our pressure transducer is famous for it’s high performance ,long term stability and solid state reliabiltiy , and competitive price too . If you have any questions ,please feel free to let us know .